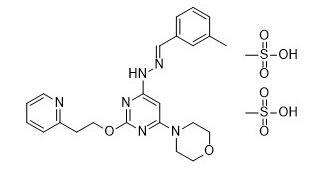 Remarks:Apilimod, also known as STA-5326, is a IL-12/IL-23 inhibitor. Apilimod inhibits IL-12 and IL-23 production - cytokines that are involved in autoimmune diseases - through the prevention of nuclear translocation of c-Rel. Synta Pharmaceuticals Corp is developing apilimod for the potential treatment of Crohn's disease (CD) and other autoimmune diseases. Preclinical studies demonstrated the successful inhibition of IL-12 and IL-23 production by the drug.